«Siddhartha» redirects here. For other uses, see Siddhartha (disambiguation). «Gautama» redirects here. For other uses, see Gautama (disambiguation). Gautama Buddha was a spiritual teacher who was born in Lumbini, a place situated in modern Nepal. He spent most of his time in Northern India, approximately 563 BCE to 483 BCE, preaching his knowledge. Born as Siddhartha Gautama (Sanskrit: «descendant of Gautama whose aims are achieved / who achieves aims effectively») he became «the Buddha» after embarking on a quest for spiritual meaning. He is universally recognised by Buddhists as the Supreme Buddha (literally Enlightened One or Awakened One) of our age. He is also commonly known as Shakyamuni or Ĺšakyamuni («sage of the Shakya clan») and as the Tathagata («thus-come-one»). 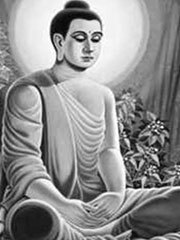 Gautama is the key figure in Buddhism, and accounts of his life, discourses, and monastic rules were summarized after his death and memorized by the sangha. Passed down by oral tradition, the Tripitaka was committed to writing about four hundred years later. Hindus regard Gautama as an avatar of Lord Vishnu. Few of the details of the Buddha’s life can be independently verified, and it is difficult to determine what is history and what is myth. Therefore this article will describe the life of Siddhartha Gautama as told in the earliest available Buddhist texts. Siddhartha Gautama was born in Lumbini that was a part of ancient Indian Sakya Kingdom and is now situated in modern Nepal, under the full moon of the sixth lunar month, in the spring. His father was Suddhodana, a King among the Kshatriya caste. His mother was Maya Devi, one of Suddhodana’s wives. The day of the Buddha’s birth is widely celebrated in Buddhist countries as Vesak. Gautama was born a prince, destined to a life of luxury. According to legend, before his birth Gautama had visited his mother during a vision, taking the form of a white elephant. During the birth celebrations, a seer announced that this baby would either become a great king or a great holy man. His father, King Suddhodana, wishing for Gautama to be a great king, shielded his son from religious teachings or knowledge of human suffering. When the young Prince Siddhartha Gautama was still a baby, an ascetic named Kaladevala went into the heaven of the 33 Gods of the Vedas, and predicted that the young prince would become the Buddha. As the boy reached the age of 16, his father arranged his marriage to Yashodhara, a cousin of the same age. In time, she gave birth to a son, Rahula. Gautama lived up to the age of 29 as a prince in Kapilavastu, a place situated now in Nepal. Although his father ensured that Gautama was provided with everything he could want or need, Gautama was constantly troubled and internally dissatisfied. Inspired by the four sights, Gautama determined to leave his home, his possessions and his family at age 29. He chose to become a monk. Abandoning his inheritance, he dedicated his life to learning how to overcome suffering. He pursued the paths of Yoga and meditated with two Brahmin hermits, and although he achieved high levels of meditative consciousness, he was not satisfied with this path. Gautama then chose the robes of a mendicant monk and headed to north-east India. He began training in the ascetic life and practicing vigorous techniques of physical and mental austerity. Gautama proved adept at these practices, and was able to surpass his teachers. However, he found no answer to his questions. Leaving behind his teachers, he and a small group of companions set out to take their austerities even further. Gautama attempted to find enlightenment through complete deprivation of worldly goods, including food, and became a complete ascetic. After nearly starving himself to death (some sources claim that he nearly drowned), Gautama began to reconsider his path. Then he remembered a moment in childhood in which he had been watching his father start the season’s plowing, and he had fallen into a naturally concentrated and focused state which was blissful and refreshing. After discarding asceticism and concentrating on meditation, Gautama discovered what Buddhists call the Middle Way—a path of moderation away from the extremes of self-indulgence and self-mortification. He accepted a little buttermilk from a passing goatherd, Sumedha. Then, sitting under a pipal tree, now known as the Bodhi tree, he vowed never to arise until he had found the Truth. At the age of 35, he attained Enlightenment; according to some traditions, this occurred approximately in May, and according to others in December. Gautama, from then on, was known as «The Perfectly Self-Awakened One», the Sammasambuddha. He stated that he had realized complete Awakening and insight into the nature and cause of human suffering, along with steps necessary to eliminate it. These truths were then categorized into the Four Noble Truths; the state of supreme liberation—possible for any being—was called Nirvana. According to one of the stories in the Āyācana Sutta (Samyutta Nikaya VI.1), a scripture found in the Pĉli and other canons, immediately after his Enlightenment, the Buddha was wondering whether or not he should teach the Dharma. He was concerned that, as human beings were overpowered by greed, hatred and delusion, they would not be able to see the true dhamma which was subtle, deep and hard to understand. However, a spirit, Brahma Sahampati, interceded and asked that he teach the dharma to the world, as «there will be those who will understand the Dharma«. With his great compassion, the Buddha agreed to become a teacher. At the Deer Park near Benares in northern India he set in motion the Wheel of Dhamma by delivering his first sermon to the group of five companions with whom he had previously sought enlightenment. They, together with the Buddha, formed the first Sangha, the company of Buddhist monks. The Buddha emphasized that he was not a god, he was simply enlightened. He stated that there is no intermediary between mankind and the divine; distant gods are subjected to karma themselves in decaying heavens; and the Buddha is solely a guide and teacher for the sentient beings who must tread the path of Nibbana themselves to attain spiritual awakening and see truth and reality as it is. The Buddhist system of insight, thought, and meditation practice was not revealed divinely, but by the understanding of the true nature of the mind, which could be discovered by anybody. For the remaining 45 years of his life, the Buddha traveled in the Gangetic Plain of Northeastern India, teaching his doctrine and discipline to an extremely diverse range of people— from nobles to street outcaste sweepers, including many adherents of rival philosophies and religions. The Buddha founded the community of Buddhist monks and nuns (the Sangha) to continue the dispensation after his Parinibbana or complete Nibbana, and made thousands of converts. His religion was open to all races and classes and had no caste structure. On the other hand, Buddhist texts record that he was reluctant to ordain women as nuns: he eventually accepted them on the grounds that their capacity for enlightenment was equal to that of men (and the Lotus Sutra, in Chapter 12, contains a description of the dragon king’s daughter attaining enlightenment in her present body), but he gave them certain additional rules (Vinaya) to follow. The Buddha’s body was cremated and the relics were placed in monuments or stupas, some of which are believed to have survived until the present. A comprehensive education and training in those fields appropriate to a warrior aristocrat, such as martial arts, agricultural management, and literature, and also a deep understanding of the religious and philosophical ideas of his culture. A superb teacher, with a fine grasp of the appropriate metaphors, and tailoring his teachings to the audience at hand. Fearless and unworried at all times, whether dealing with religious debators, royalty, or murderous outlaws. He was never past exasperation when monks of his order misrepresented his teachings. Temperate in all bodily appetites. He lived a completely celibate life from age 29 until his death. He was indifferent to hunger and environmental conditions. 3. Like the full moon is His face; He is dear to Gods and men; He is like an elephant amongst men; His gait is graceful as that of an elephant of noble breed.That, indeed, is your father, lion of men. 4. He is of Aryan (aristocratic nobility) lineage, sprung from the warrior caste; His feet have been honoured by Gods and men; His mind is well established in morality and concentration.That, indeed, is your father, lion of men. 5. Long and prominent is His well-formed nose, His eye-lashes are like those of a heifer; His eyes are extremely blue ; like a rainbow are His deep blue eyebrows. (The word used is «adhi nila», meaning «very blue», nila is used for the word blue sapphire. )That, indeed, is your father, lion of men. 6. Round and smooth is His well-formed neck; His jaw is like that of a lion; His body is like that of king of beast; His beautiful skin is of bright golden colour. That, indeed is your father, lion of men. Interpretations may vary, and the reliability of the Sutras may be questioned. The description above is indicative of a typically Indo-Aryan body type. This can also be related to the tradition describing the historic Buddha as a member of the Indian Kshatriya warrior caste. The Four Noble Truths: that suffering is an inherent part of existence; that suffering is caused by attachment(craving); that craving can be ceased; and that following the Eightfold Path will lead to the cessation of craving (and suffering). The Noble Eightfold Path: right understanding, right thought, right speech, right action, right livelihood, right effort, right mindfulness, and right concentration. The law of dependent causation: that events are not predestined, nor are they random, but that events are caused by the actions that preceded them. Rejection of the infallibility of accepted scripture: teachings should not be accepted unless they are borne out by our experiences. Anicca(pronounce as «anatesa»): That all things are impermanent. Anatta: That the perception of a constant «self» is an illusion. Some Hindu denominations regard Buddha as the ninth avatar of Lord Vishnu. Buddhists in general do not consider the Buddha to be God or an avatar of any god. The general decline of Buddhism in India has been attributed to the development of Vedanta philosophy which began challenging Buddhism’s philosophically strong image. Some Muslims believe that Siddharta Gautama is the same person who is referred to in the Koran as Dhul-Kifl, and that he was therefore a prophet of Islam. The meaning of Dhul-Kifl is unclear, but, according to this view, it means «the man from Kifl«, where Kifl is the Arabic pronunciation of Kapilavastu, where the Buddha spent thirty years of his life. More common views, however, hold that Dhul-Kifl was a different person and not a prophet at all, or that he was the prophet called Ezekiel in the Bible. The legend of «Barlaam and Josaphat», written down by St. John of Damascus some time around the 7th century, bears a close resemblance to the story of the Buddha. Barlaam and Josaphat found their way into the Roman Martyrology (27 November), and into the Greek calendar (26 August). Meditation and teachings of Buddha have been adopted by many Jews in their worship ceremonies. Because Buddhism is centered around a path instead of a God, its teachings are often adopted without having to convert or let go of any beliefs. Jews who follow Buddhist customs are called Jubus or Bujews.